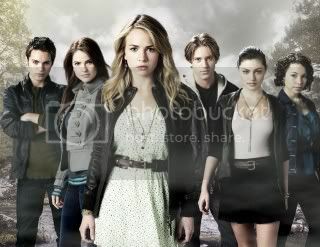 The Secret Circle este un nou serial The CW creat de Andrew Miller si bazat pe romanul scris de L.J. Smith. Britt Robertson (Life Unexpected, Swingtown), Ashley Crow (Heroes), Gale Harold (Vanished, Queer As Folk), Jessica Parker Kennedy, Louis Hunter, Natasha Henstridge (Eli Stone), Phoebe Tonkin (H2O: Just Add Water), Shelley Hennig, Thomas Dekker (Terminator: The Sarah Connor Chronicles) fac parte din distributie. Plasat in orasul fictiv Chance Harbor, Washington, serialul spune povestea unei adolescente din California care afla ca face parte dintr-o familie de vrajitoare. Cassie Blake era o tanara normala si fericita pana cand mama ei, Amelia, moare intr-un tragic accident [aparent]. Cassie se muta apoi la bunica ei Jane, in frumosul orasel pe care mama sa l-a parasit cu multi ani in urma – unde localnicii par sa stie mai multe lucruri despre Cassie decat ea insasi. The Secret Circle va fi difuzat din toamna anului 2011, in fiecare joi. Share the post "The Secret Circle"
I a minute ago approximating Your Article on the subject of Khmer Humourous » Somnangblogs Great merely what I was looking for!. Dead written written content, thanks for entropy. “The bravest thing you can do when you are not brave is to profess courage and act accordingly.” by Corra Harris. Immediately after examine many of your weblog articles in your internet site today, and I the truth is such as your way of blogging and site-building. I saved that to be able to my personal book mark world-wide-web web-site checklist and may likely be checking back shortly. Could you attempt my web page due to the fact accurately and also inform me what you assume.